This year’s program committee chair, Om Sukheenai, has been hard at work to come up with interesting, inspiring, fun, educational and relevant topics for our meetings. She welcomes your ideas. Last week, she tried a new format to help us connect better as members. We had the juxtaposition of a Classification Talk by a new member, Shannon Buckmaster, with a “Reprise Talk” from a long-time member, Auggie Gonzales. To quote Auggie after Shannon’s talk, “Wow.” Both talks were amazing, presented different perspectives, and helped us to really get to know these two Rotarians. Shannon Buckmaster gives her Classification Talk. However, she was always a top achiever in school, and had “angels, mentors and protectors” who helped her. At 16, she became a ward of the state of Washington. At one point, she tried to force her mom into drug rehab. Her mom responded by telling her she had 30 minutes to pack up and get out. She was able to turn to one of her angels, Carol, who took her in and taught her a lot…even how to apply for scholarships. She was accepted to George Fox. At GFU, she met Dr. Paul Anderson, who kept asking her, “Where are you going to go to grad school?” With his help, she applied to top schools like Yale and Harvard, and decided on Yale. “So I got married and went off to Connecticut and Yale.” And then surprises started hitting: she got pregnant, found out her husband was mentally ill and abusive, and her daughter was born prematurely. She said she “played the biggest game of poker in my life. I sat down with one of the deans and asked for help.” It turned out they were able to help her and her daughter– with rent, health care, meals and other living expenses. Within 22 months of starting, she had earned the coveted “Pink Cadillac” for outstanding sales. 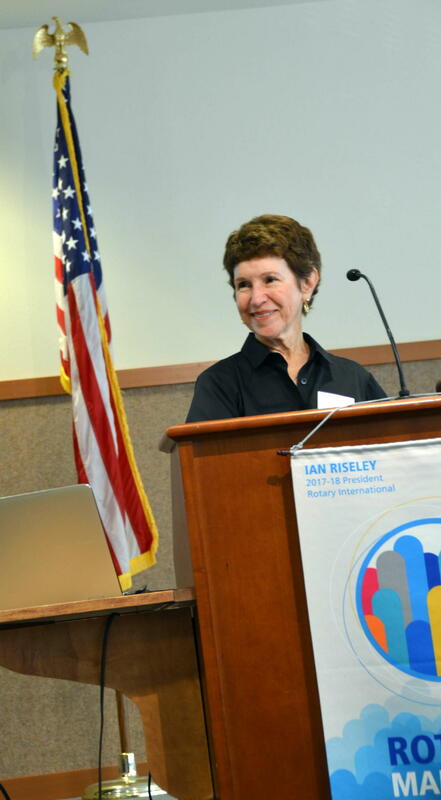 She became a trainer for the company’s 650,00-strong U.S. sales force. Three years ago, Mary Kay sent out a film crew and interviewed her on her life story and condensed it to a three-minute Public Service Announcement. She said people still recognize her and come up to her to talk about its message of eradicating domestic violence. 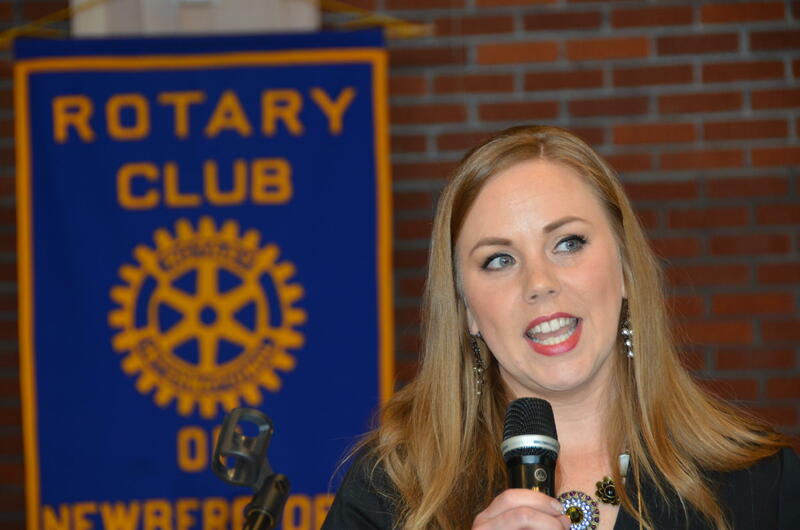 A new part of her journey started last year when she felt called to start her own company– Shannon Buckmaster LLC, and embark on a speaking career. “I hope you hear that I am not bitter, not angry. I love my mother as my sister. She is giving me a gift. I have forgiven her and I am inspired. I stand for compassion, for resiliency, for self agency. I’m a survivor. I’m not a victim.” She hopes to use her talks to share that message, offer hope and inspire others. Why would she join Rotary? And we are so glad to have you, Shannon. We expect this next part of the journey will be amazing. Auggie did his first Classification Talk in 1996 (there were only two people in the room last week who were present for that). 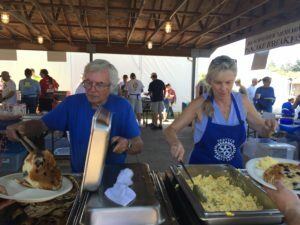 He said that after joining Rotary back then, he was really impacted by one person in particular–Ed Stevens, the former president of George Fox. “Ed used to see good qualities in people and say, ‘Now there is someone you want on your team. '” And then Auggie pointed to Shannon. 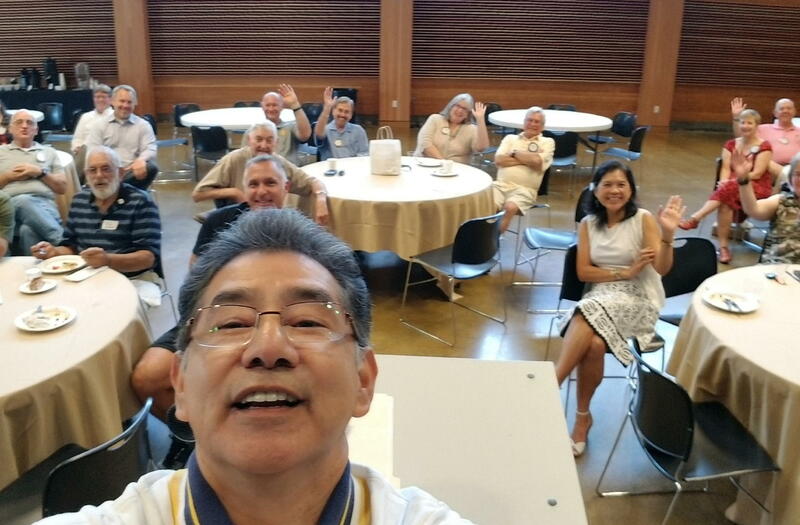 Auggie is usually our club meeting photographer, so he took a “selfie” during his Talk. He started with “10 Descriptors of Auggie” and asked us to guess which ones were true or false. Amazing things, like one of his great grandparents rode with Poncho Villa. Turned out each and every one of the them was true! Auggie was born 64 years ago and is from Topponish, Washington. He has two older and two younger siblings, and lived a block away from his grandparents. He said, “Looking back, even though we were poor, I did not know it. My parents’ attitude overshadowed” their situation. In 1970, he did not know he was going to college, either. University of Washington recruiters came to him, and he figured he would take advantage of a free trip to Seattle. Turns out he was accepted, and he said that out of 125 Hispanic students recruited, five graduated….and he was one. He got a B.S. in Social Welfare. We got a regular photo of Auggie speaking, too. He went to work in Yakima as an in-house consultant, and then was recruited to work in LA. 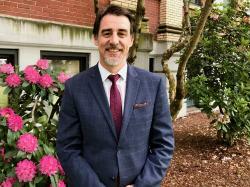 He said L.A. is a great place to work, but not to raise a family, so he came back to Portland and became a “Mr. Mom” for awhile. He relishes the time spent with his children. 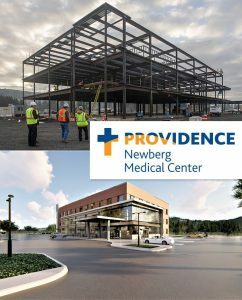 He got interested in the health care field, and found an opportunity, in partnership with his brother-in-law, in the emerging area of “urgent care.” After researching possible locations for a clinic, Newberg was his top choice due to the feeling of community here. 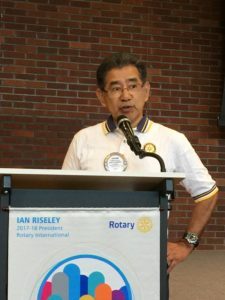 When his brother-in-law had some financial challenges that impacted the business, he said “Rotarians helped me,” and he was able to purchase the business in its entirety. He described what “urgent care” is and the services his clinic provides, from on-site lab work and x-rays to small surgical suites. “The cost is seven to ten times less than going to the emergency room,” he said. They can treat everything from a minor cold to a fracture, and also do drug screening. Sigh…..The last Tunes on Tuesday concert is this week. Come listen to the music of Hit Machine and enjoy the waning days of summer. 6:30pm on the 29th at the Cultural Center. Speaking of the end of summer, the Early Birds Club will be doing Oktoberfest at the Cultural Center this year on Sept. 15 and 16. The countdown is on for the International Day of Peace on Sept. 21. Our Peacebuilder Committee has lots planned. For the second year in a row, a “Random Acts of Kindness Day” is planned in Newberg, so please start thinking about a nice thing you can do that day to help make our community an even better place. The committee will help sponsor a new “Peace Poles Trail” walk on Saturday, Sept. 16 at noon, and will unveil its new “Peace Poles” brochure, to be distributed around the local area. Volunteers are needed to help with brochure distribution starting Wednesday, Sept. 20. Wineries, dental and doctor offices, public spaces….anywhere we can get approval to place them. If you have a location that would work, please contact Suzanne Miller. 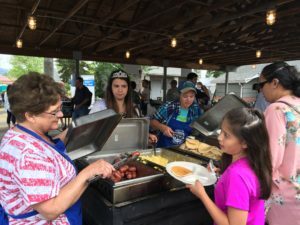 Don’t forget the pig roast… a fun, casual get-together of local service clubs at the third annual Newberg Early Bird Rotary end-of-summer BBQ. Please bring a side dish to share, a drink and a chair. Plates, tableware and cups provided. Look for the Rotary “wheel” sign at the entrance to the driveway. And last but not least, Sept. 1 from 10am to 6pm is the special event at Avamere Newberg. Please contact Rachel Huber if you haven’t RSVP’d yet. Denise Bacon brought new Newberg City Councilor from District 1, Matt Murray, as her guest. He has lived in Newberg for five years, and said he keeps busy restoring a 1910 Craftsman-style house. Rick Kaufman joined us again….should be an official member of our club this week! Auggie mentioned that dates for the 2018 Guatemala dental trip have been announced…..It will be the first week of March. The Auction Committee is planning to meet on Sept. 6th. Last week, Al Herriges announced grandchild #6 is on the way….this week he announced #7 is, too. And Curt Walker announced his first great grandchild! 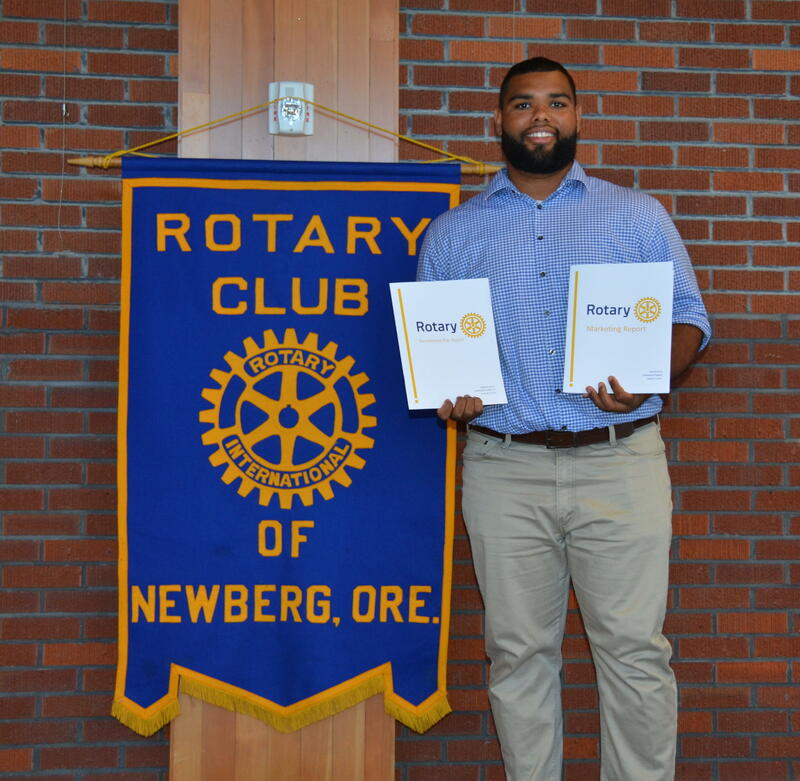 We had two speakers last week: Mike Pollock, the county director for Helping Hands Re-Entry Outreach Centers, and our George Fox intern, Dominique Thibault. In a very authentic, moving and oftentimes humorous Classification talk, Mike started “at the beginning” with his birth: the heaviest child ever born at that hospital up to that time, at 10 1/2 lbs! Mike Pollock does his Classification Talk. Originally from Long Island, New York, Mike described how he spent 35 years–from ages 13 to 48–as an alcoholic/addict. A cardiac event at age 48 brought him to the point of “enough is enough,” and he began getting his life together. His job now is helping others get their lives together. “The best part of my job is when I am thanked by people for their ability to be clean and sober,” he said. There is definitely a forecast for increased employment opportunities in his field. “The suicides that are happening in Newberg are so difficult. There is a huge opioid addiction problem. We need mental health and drug counselors. There’s plenty of need,” he said. Why did he join Rotary? “Because all the other clubs that asked required I have a Harley,” he joked. He said he felt a bit intimidated because he saw successful people in Rotary, “and I just started my success in 2010. But lo and behold, you guys are people! And I want to be around successful people.” He said he now uses the Four-Way Test in his work. “That about sums it up,” he said. Thanks for sharing your amazing story with us, Mike. George Fox summer intern Dominique Thibault displays the two reports he developed for the club. Dominique started his presentation by handing out two impressive-looking documents that were the result of his summer internship with us: A Marketing Report and a Recruitment Plan. As with all good marketing plans, Dominique started with research. He summarized some of the key results for us, as well as the strategies he developed from them. Regarding prior knowledge of Rotary, 73% of those answering basically knew nothing about Rotary prior to joining. When asked how they were recruited to join the club, 60% percent of those answering were invited and 28% were self-recruited. He outlined the target audience for his plan: professionals in the 35-to-55-year-old age bracket. 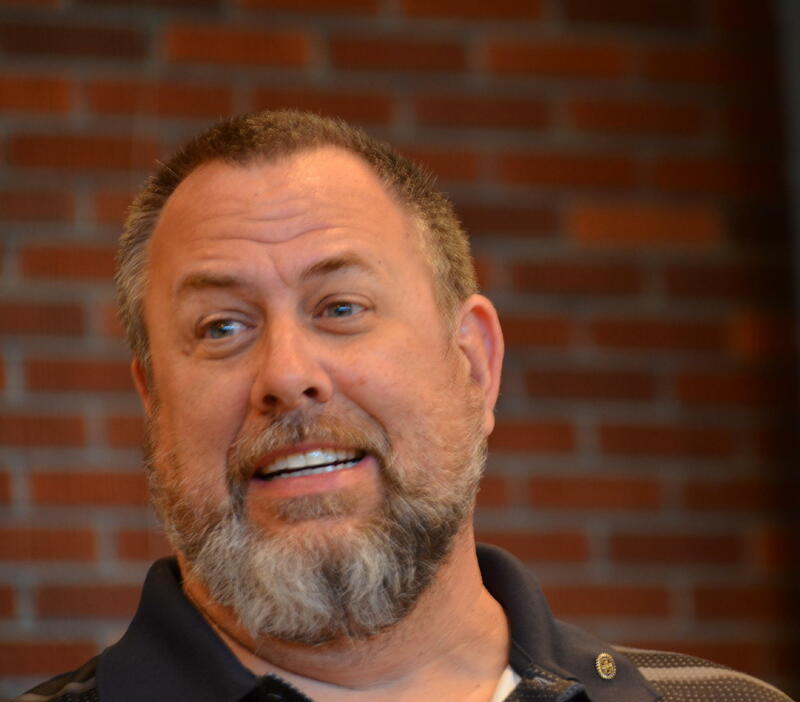 “Folks in this bracket have a passion to serve, and there is a wide range of professionals in Newberg. They will want to see our mission and our service projects,” he said. The main goal of the marketing plan, according to Dominique, is to increase awareness. He recommended that a marketing subcommittee be formed, with people assigned to social media, events, and outreach. He also suggested more use of promotional items, like coffee mugs and tee-shirts, and signage to create more interest and exposure. For the recruitment plan, Dominique said he wanted to challenge current members to recruit new ones. He also recommended setting a meeting on how to recruit based on the occupational fields we would like to attract. 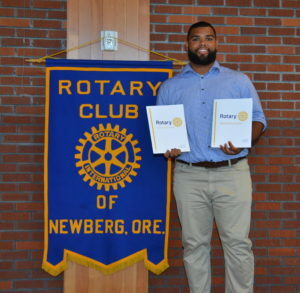 When asked what lessons he learned during this process, Dominique said, “Don’t be afraid to ask questions.” He said he knew nothing about Rotary when he started, but learned what a diverse service organization it is. Great job, Dominique. Kudos to Geoff Gilmore for overseeing Dominique’s internship. Please see Geoff if you did not get copies of the reports. Gary Stewart, the new president of the Morning Club, was our honored guest. He extended two invitations–to the upcoming Pig Roast (see details below) and to the Oktoberfest, Sept. 14-16 at the Cultural Center. Rick Kaufman has filled out the paperwork to become a member of our club. Fingers crossed he can be officially inducted by District Governor Renee Campbell when she visits on the 30th. Jim McMaster introduced Terry Paskett and his two sons, who had volunteered to lay the bricks for the new Cultural Center patio. Wow…that is some volunteer service. Help welcome freshmen at Newberg High School from 11am to 1pm on Sept. 5. Paula Radich recently sent out an email with the sign up sheet. Laura Tilrico is celebrating her 42nd wedding anniversary…and they said it would never last…..
Dave Parker’s oldest son is getting married in a little over a week……congrats, Dave! 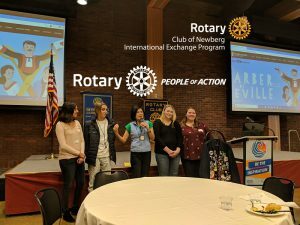 You’re invited to a pig roast……and a fun, casual get-together of local service clubs at the third annual Newberg Early Bird Rotary end-of-summer BBQ. 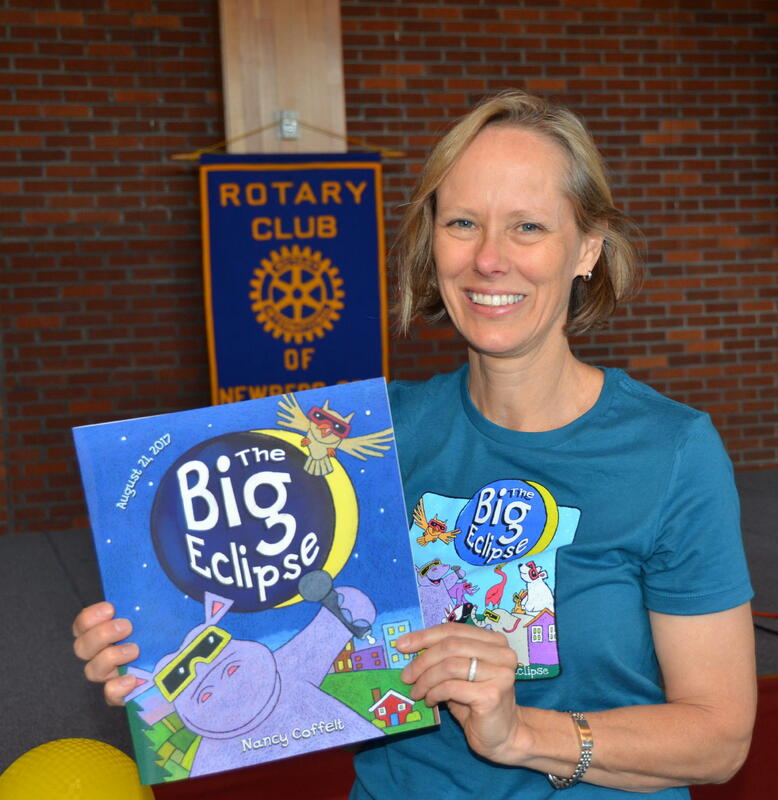 ….because our speaker last week, Elaine Keiler, CEO (Chief Eclipse Officer) of The Big Eclipse, provided such great information –and even viewing glasses–that I’m sure we’re all looking forward to this event. Elaine said she learned about the 2017 total eclipse a few years ago when she was in Iceland watching an eclipse. She wondered who was going to talk to families in the U.S. about this event. She thought it was a great opportunity to teach kids about nature and science and to get people off their cell phones. 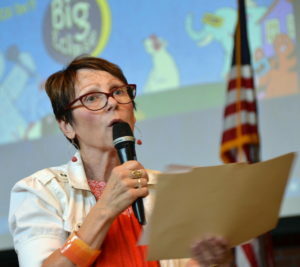 She decided to publish a book for kids, and to focus on Oregon–because other parts of the country, like the South, have weather issues like thunderstorms, etc. She noticed 6000 people leaving the airport in Iceland in one day after the eclipse there. She said we should expect lots of visitors, and many to stay 6 or 7 days and combine eclipse watching with a vacation. She also predicted traffic could come to a virtual standstill. This eclipse is different because it will go over the entire U.S.A. It should start getting darker in Newberg at 9:05am, she said, and should last 1 minute; 56 seconds. Newberg is not quite in the path of totality. She stressed that you need to protect your eyes and not look directly at the sun. You can make a solar viewer from a paper plate, like you did as a kid. Need some ideas as to where to watch? 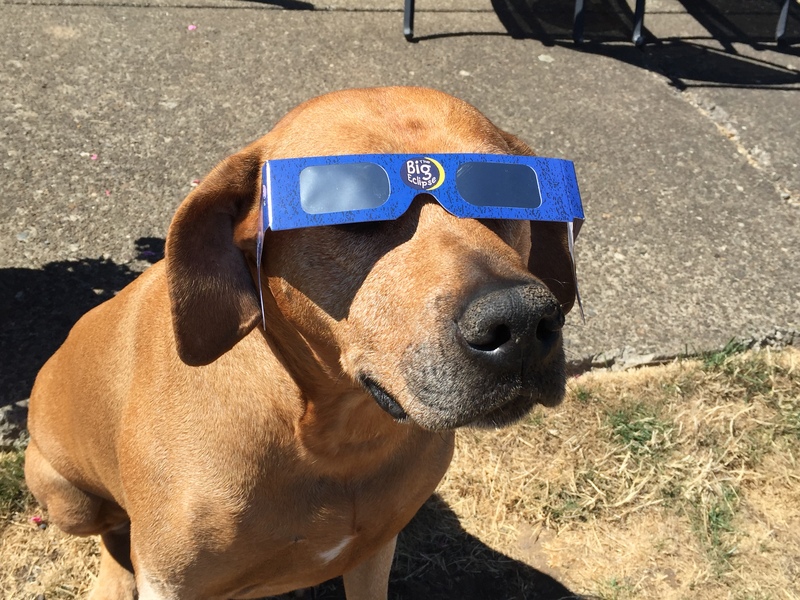 Elaine had some ideas…a three-day festival Aug. 19-21 at the Polk County fairgrounds, or a “Wine Country” Eclipse at Eola Hills Wine Cellars featuring music, wine tasting, arts and crafts, seminars on wine, food, astronomy and more. For more info, go to winecountryeclipse.com. Let’s hope we get a chance to see it…the next one isn’t till April 8, 2024, and it’s not coming to Oregon. 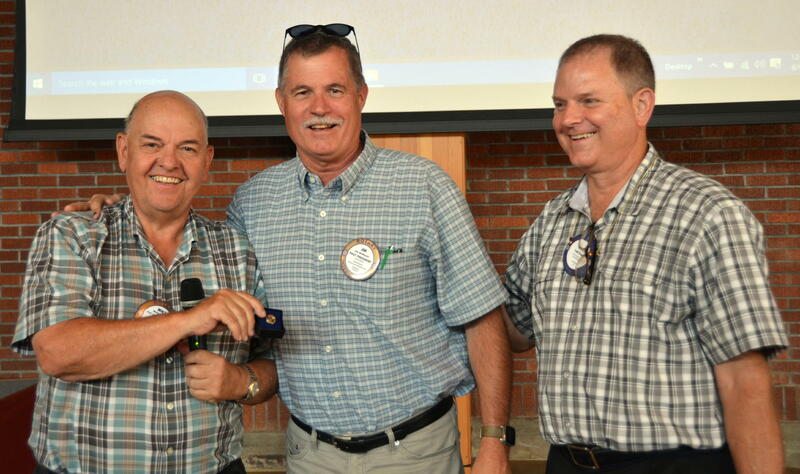 Mike Caruso, left, and President Todd Engle, right, presented Jim McMaster with a Paul Harris award for his contributions to the Rotary Foundation. Congrats, Jim. 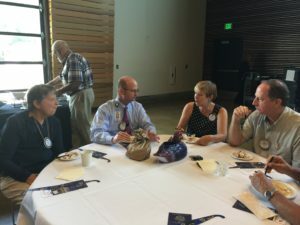 The “Eat Dessert First” clublet was back in session last week….Some of the members, including, left to right, Paula Radich, Grant Gerke, Becky Ankeny and Geoff Gilmore, were seen scarfing up chocolate pie and chatting before lunch. If you’re interested in a little more social time, come a few minutes early and join the fun. 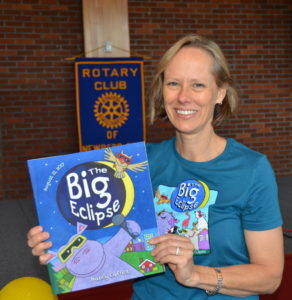 Mary Lynn Thomas from the Newberg Library came to thank Rotary for the summer reading program grant. She had a long list of things the grant enabled her to do, from purchasing things like books for kids, kindles, and browsing bags to providing materials for the upcoming “Get Set for School” program. She said over 2000 kids benefitted from the grant. Also joining us for lunch were Paul Jellum‘s wife, Chris, and Laura Tilrico‘s sister-in-law, Marni Tilrico. Denise Bacon‘s skills and talent as gourmet chef were touted by both Jeff Lane and John Kerekanich last week. Jeff bid on the ravioli-making class Denise donated to the auction, and said he had a fantastic time and enjoyed really delicious food. John is on the Police Foundation Board and attended a party for which Denise prepared the food. “The food was professional quality and amazing,” John said. Denise also donates her time to Peace Village each June to prepare meals for the children for the week-long camp. Way to go, Denise! Interested in golf for a wonderful cause? Our club foundation is a sponsor for this year’s Toy and Joy golf tournament on Sunday, Sept. 10 at Chehalem Glenn Golf Course. Please contact Spike Sumner for more info. CALLING ALL COOL CATS AND DAMES! Reserve your spot now. RSVP to Rachel at 503-554-0767. Where will YOU be during the August 21st solar eclipse? Have you decided yet? Some say our own state capital, Salem, is one of the best places in the entire U.S. to observe it. But, we might want to wait to hear from our speaker this week, who will will be telling us all about this rare event. REMEMBER: We’re back at the Cultural Center for this week’s meeting. Many thanks to Club President Todd Engle and the great staff at Friendsview for hosting us a number of times in the past few weeks. 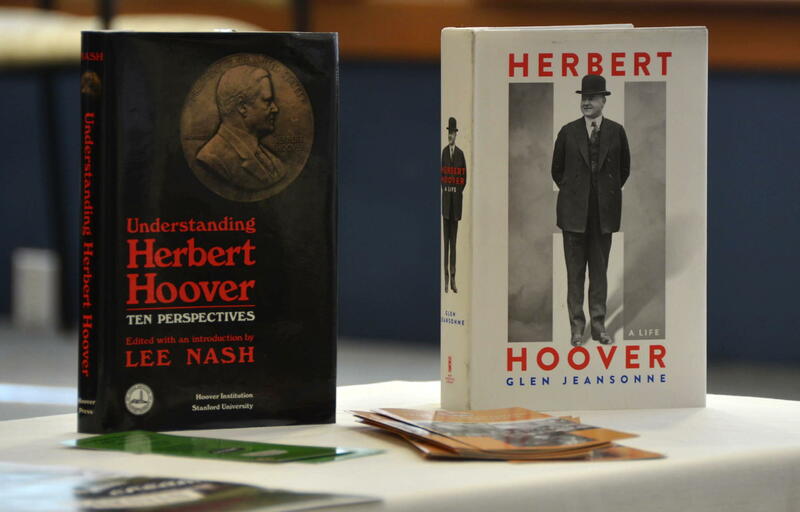 Sarah Munro discusses Herbert Hoover and his ties to Newberg. 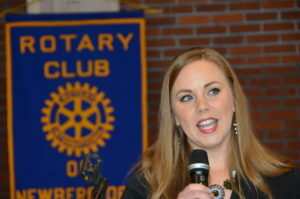 Last week’s speaker was Sarah Munro, director of one of Newberg’s “hidden gems”–the Hoover Minthorn House Museum (HMHM). Sarah told us about the 31st President, Herbert Hoover, and his ties to Newberg’s heritage. Orphaned at the age of 11 in West Branch, Iowa, Hoover was brought to Newberg by his uncle, Dr. Henry John Minthorn. The Minthorns had lost their only son the year before and needed a boy to help with the chores. One of “Bertie’s” (as the boy was called) jobs was to keep wood in boxes by the four wood stoves in the house and the kitchen stove on the back porch. He was also required to feed and water the horses and milk the cow. For the first and only time in his childhood, Bertie had his own room. The furniture in Hoover’s room at the museum is the same furniture he used when he lived in Newberg. Dr. Minthorn became the first superintendent of the Friends Pacific Academy, which provided a good school for Bertie. Hoover left Oregon to enter the first class at Stanford University in 1891. In 1895, he graduated in geology, and met Lou Henry. He worked in a gold mine in Western Australia where he developed techniques to operate the mine more efficiently. The British mining company where he worked transferred him to China. By this time, Lou had graduated–the first woman to graduate from Stanford in geology. They were married in 1899 and the next day set off for China. When the Boxer Rebellion broke out, the Hoovers moved to London, where they were when World War 1 started. Sarah shared Hoover’s humanitarian accomplishments–a side of the president not often known. Hoover’s many food relief efforts started with the Commission for Relief in Belgium, an effort that fed 10 million people. In 1921, through the American Relief Administration, aid was provided to the Russian peasants in the Volga River area and Hoover was again credited with saving millions of lives. In April 1947, school meal programs in the Allied zones were organized to feed more than 3 million children. Partly through Hoover’s efforts, the United Nations established UNICEF. According to Sarah, through his relief efforts, Hoover likely holds the record for the total number of people saved from starvation. When Hoover was president, he called together the first White House Conference on Child Health and Protection and it created the Children’s Charter. The HMHM is the only presidential property in the Pacific Northwest, and the only separate museum facility in Newberg. The home was built by Jesse Edwards, one of the fathers of Newberg. The museum, Herbert Hoover Park and the Herbert Hoover Highway were dedicated at a ceremony that was attended by President Hoover and some 3000 people on the anniversary of his 81st birthday in 1955. You might want to check out this year’s celebration of Hoover’s 143rd birthday on Saturday, August 12th. From 1 to 4pm, admission to the museum will be free, and there will be music, games, ice cream by Cream Northwest and a free coffee cupping by Caravan Coffee. Sarah brought some books for those with an interest in learning more about President Hoover. They are available at the Newberg library. Visiting Rotarian Rick Kaufman joined us for the third week in a row. Looks like he will be transferring to our club very soon!